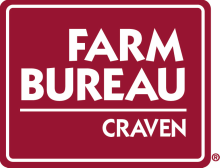 The Craven County Farm Bureau Annual Meeting was held at Core Creek FWB Church Fellowship hall on Thursday, November 2nd, 2017 at 7pm. A meal was catered by Vel and Mel’s. Our guest speakers were Lee Kirkman with Kirkman Farms on Hwy 55 in Cove City and Kristen McCoy with James W. Smith elementary school. We hope you will be able to join us for our Annual meeting and meet your Craven County Farm Bureau Board Members and enjoy good food. Canned Food Donations will be collected at the door. ​2018 Annual meeting be held on November 1st, 2018, 7:00 pm at Core Creek FWB, Cove City. The Craven County Farm Bureau Board of Directors, along with the Young Farmers & Ranchers, joined with the Partners in Education on Saturday, August 15, 2015 at the Walmart on MLK Jr. Blvd. for their Stuff the Bus event. Farm Bureau collected and donated $200 worth of school supplies which will benefit students in need across the county.